Tobii have released a device that allows control of computers using your eyes. 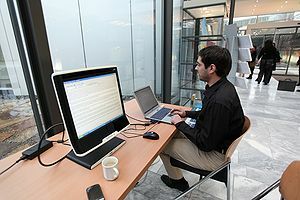 The device, about the size of a pen, attaches to the bottom of your screen and monitors eye motion. Users of prototype devices have said how it “works like a dream” with Windows 8 enabling full control of navigation, scrolling, selecting and zooming. Combined with increasingly sophisticated voice recognition and gesture recognition these new technologies are more examples of how interacting with computers will become more intuitive and natural in the future. The Sci-Fi films weren’t so far fetched after all.